Many Americans today identify Islam with maniacal hatred of the West. The Other Islam transforms this image and opens the way to finding common ground in our troubled times. Sufism, a blend of the mystical and rational tendencies within Islam, emerged soon after the revelation of Muhammad. A reforming movement against the increasing worldliness of Muslim society, it focuses on Islam's spiritual dimension. Described as "Islam of the Heart," Sufism has attracted adherents among both Sunni and Shi'a Muslims, as well as Jews, Christians, Hindus, and Buddhists. 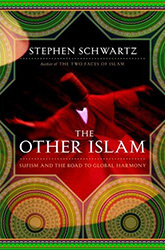 In The Other Islam, Stephen Schwartz traces the origins and history of Sufism, elucidates its teachings, and illustrates its links to the other religions. He comments on such celebrated Sufi poets and philosophers as Rumi and Al-Ghazali, and narrates their influence on the Kabbalah, on the descendants of the Jewish philosopher Maimonides, and on Christian mystics like Saint John of the Cross and Saint Teresa of Ávila as well as the American transcendentalists. Furthermore, Schwartz presents a fresh survey of Sufism in today's Islamic world, anticipating an intellectual renaissance of the faith and alternatives to fundamentalism and tyranny in Iraq, Saudi Arabia, Turkey, and Iran.